Frederik van Amsterdam was a well-known glass painter of the sixteenth century in Holland. He designed the fine windows of the abbey of Tongerloo. 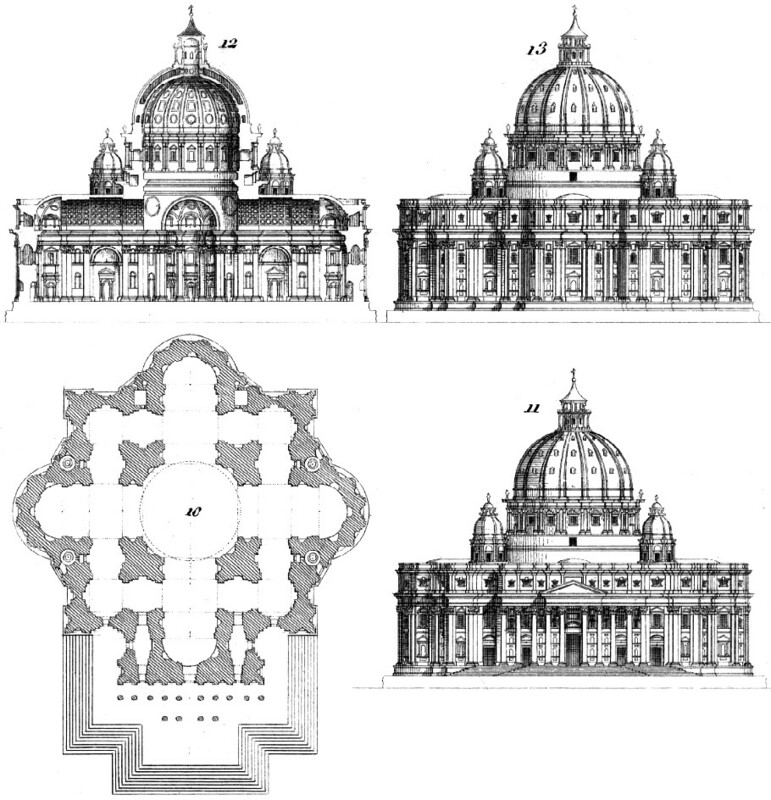 Development of St. Peter's from 319 to 1546 to 1667. In 1546, Michelangelo, then in his seventy-second year, succeeded Antonio da San Gallo, the Younger, and the present building owes most of its outstanding features to him. 10-13. 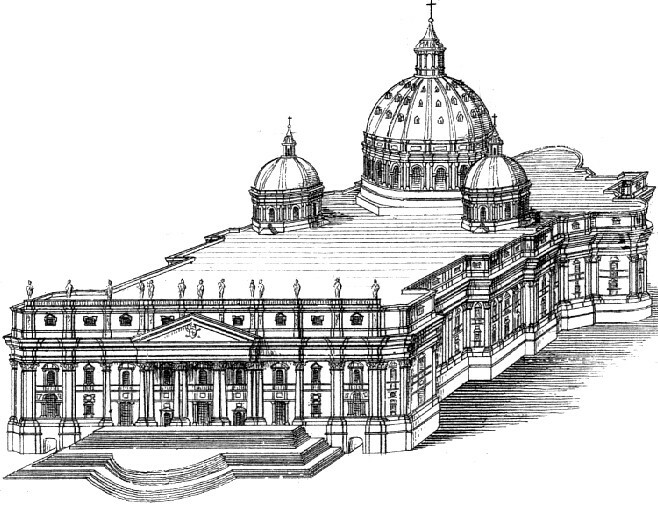 Plan, front elevation, transverse section, and back elevation of the Church of St. Peter, as designed by Michael Angelo. 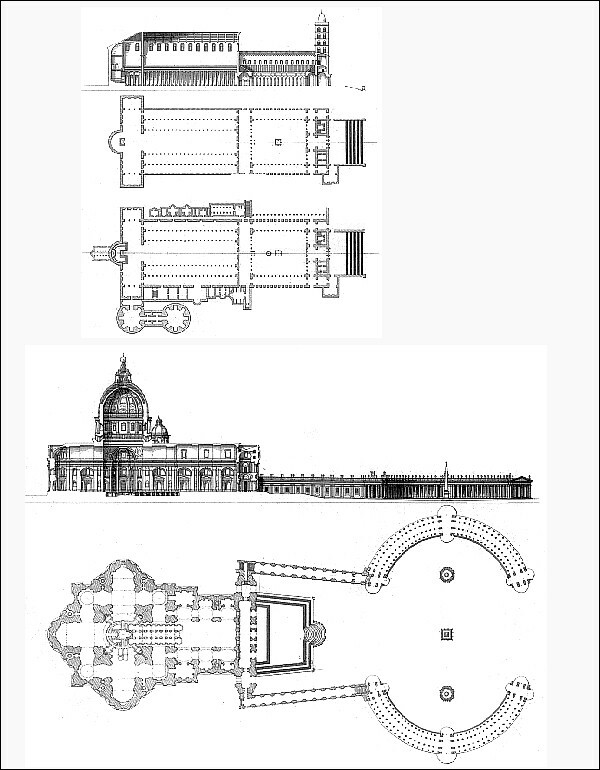 Fourth plan by Michael Angelo, who endeavored to restore the Greek cross as designed by Peruzzi. During the seventeen years that this great man occupied the post of architect to the Church of St. Peter, entrusted to him by Paul III after the death of Sangallo, he continued with indefatigable ardor the works necessary for the execution of this plan; but after his death it underwent many changes, more particularly the change from a Greek to a Latin cross by prolonging the front arm, executed by Carlo Maderno under Paul V.
The use of the architrave again appears in the sixteenth century in the Church of St. Peter, as well as in many other churches built after its model. 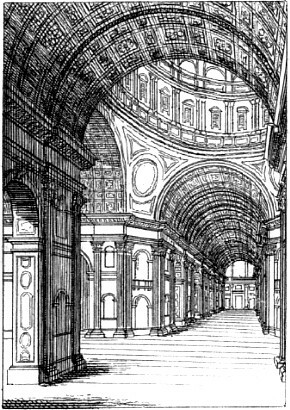 Vaulting of the nave of the Basilica of St. Peter. Base, capital, and entablature of the columns from the interior of the Basilica of St. Peter, by Michael Angelo. 7. Portion of the exterior of the Basilica of St. Peter. 8. 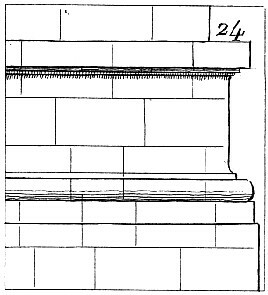 Profile of the exterior basement of the Church of St. Peter, with the base of the pilasters. 9. Corinthian capital of the pilasters and the entablature round the exterior of the Church of St. Peter. 10. Base and cornice of the attic which terminates the exterior decoration of the same. 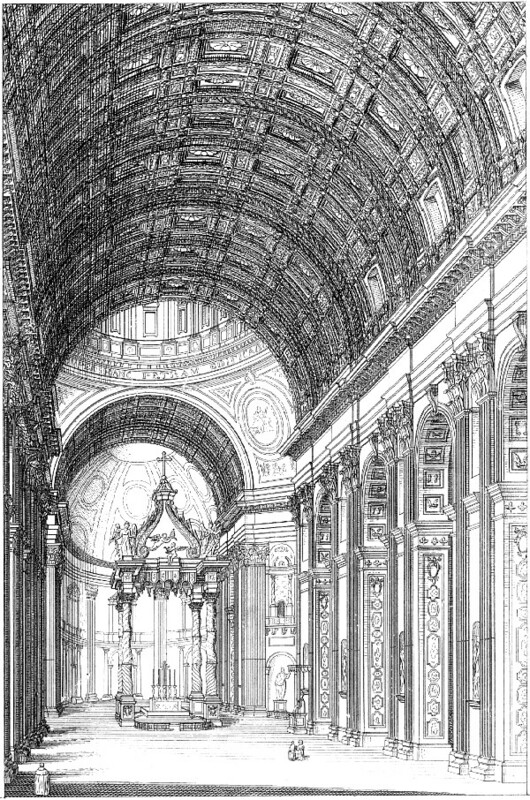 The great nave of St. Peter's; the vault is executed in stucco gilt, of the greatest magnificence. 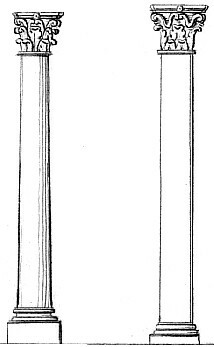 Plan and section of the cupola of the Church of St. Peter. 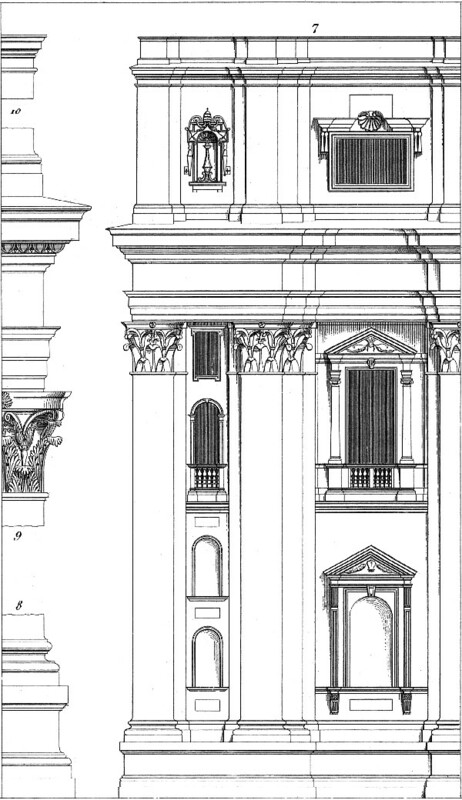 Stylobate, base, capital, and entablature from the exterior of the same. Bird's-eye view of the Church of St. Peter. 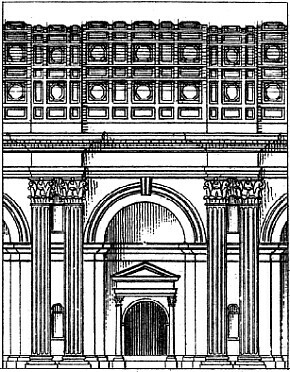 The exterior stylobate of the Church of St. Peter, by Michael Angelo, constructed after the principles of the ancients.